It’s a puzzle that has haunted writers, artists and other creatives since the caveman first applied ink to a wall. What do you do when you’re stuck for inspiration? How do you solve writer’s block? In my day job I co-lead a digital communications team tackling difficult problems. It can be a rollercoaster ride. Digital is a still very new in the grand scheme of things. It’s also a very fast-moving world. This leads to challenges in how we even do our work. Blockbox is a set of cards designed to help creatives in agile teams get past these challenges. 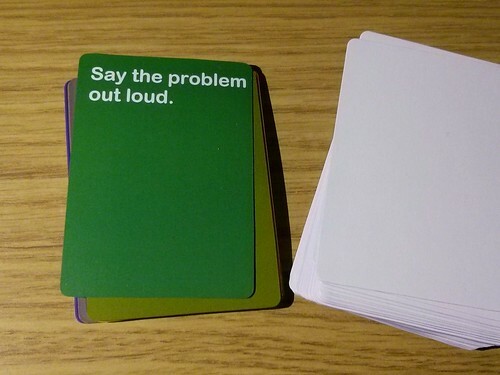 Created by Giles Turnbull, it is a deck of cards containing ideas to help you think differently about your problem. The idea is to select one at random and follow the instructions. The card you select may not always feel relevant to your project. But in a way that’s the point. The cards challenge you to look at your problem from another angle that you wouldn’t have otherwise considered. In this case, I wasn’t sure if saying the problem out loud would help. I even had trouble articulating to myself what the problem was. But after I dutifully spoke to myself about the problem I was having, the words eventually began to flow. Not straight away, but they did flow. I first found out about Blockbox via the University of Bath’s digital marketing and communications team. They appear to be one of the most innovative digital teams in higher education, so I always like to keep an eye on what they are up to and how they are working. The version used by Bath was called Strategies for agile creatives. In true agile style, the concept has been iteratively improved to now become Blockbox. 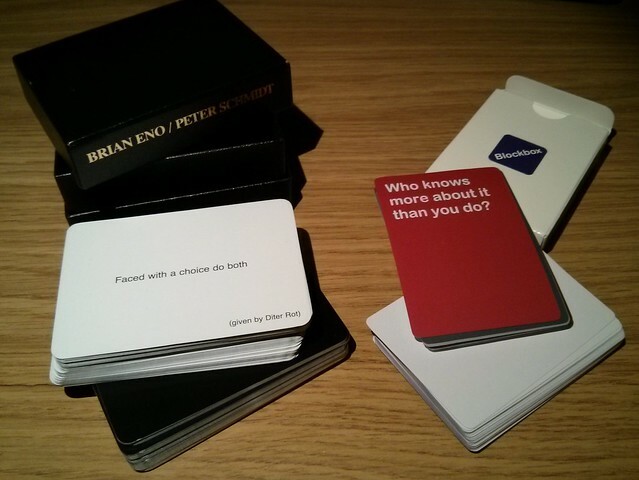 The card on the left of the photo is from Oblique Strategies by Brian Eno and Peter Schmidt. This 40 year old concept provided the inspiration for Blockbox. As a fan of Brian Eno, I was familiar with the idea, but I had never owned a set of Oblique Strategies. Spurred on by the University of Bath’s use of their two sets of cards, I ordered sets of my own. I brought them in to share the idea with my colleagues at the University of St Andrews, who also liked the idea. It has to be said that the Oblique Strategies are rather more… well, oblique. The instructions are less clear. It is not even clear what the correct way to use the cards is. It all feels a bit mystic, and not terribley rooted in reality. The Oblique Strategy I drew for this article said, “Only one element of each kind”. I can’t say I followed the instruction. But the idea is fascinating. Blockbox brings the concept closer to the real world. Perhaps I feel that because it is designed for people working on digital projects and familiar with agile, and was partly inspired by ideas from the Government Digital Service. Everyone I have shown the cards to likes the idea of Oblique Strategies. But they have also all preferred the implementation of Blockbox. Blockbox is currently sold out, but you can put your name on a waiting list to find out when a new set will be ready.